Have you ever had a day that by 9 a.m. you wanted to start all over again? Does your entire life sometimes feel like that? Listen to Paul's hope-filled letter to the Colossians. 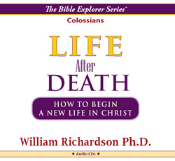 If you would like to make a fresh start, this series is especially for you.Dr William Richardson will aquaint you with a group of people in the process of starting over. Please be patient to receive your Download Link in Email. Typically it will take about 1 hour; however, it may be later on weekends or evenings. William Richardson Ph.D. has devoted his life to the teaching ministry, equipping students with Biblical principles for studying and applying Scripture to life as we face the 21st century. He has been Dean of the College of Arts and Sciences at Andrews University where he was Professor of New Testament Studies and Chair of the Religion Department prior to his appointment as Dean. Dr. Richardson eagerly anticipates that time when we can sit at the feet of Jesus and Paul and have all our questions answered.